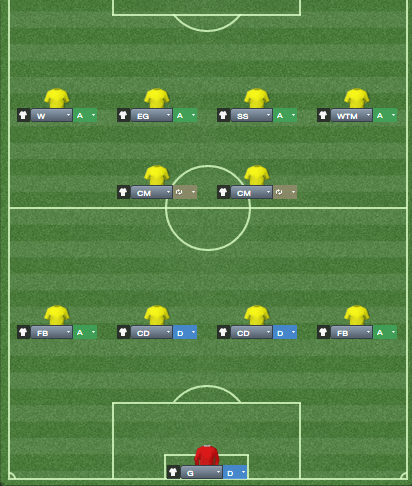 As I mentioned in a previous post, I was in dire need of a Plan B for my strikerless formations. The idea I had was to mix up Stoke City under Pulis, an aggressive, direct style of play, with the fluid motions of the strikerless style I normally play. With opposing teams ceding their wings to us and sitting inside their own box, we needed a sort of targetman to make sure we were able to break down such a defence. The initial call for help lead to several ideas. I’m not going to take credit for them, because they weren’t my own. The first one was by Shrewnaldo. Well, actually he made two points. I wonder, if this becomes almost impossible to implement in FM14 with the restricted interface, if it might be more plausible to select one of the wide AMs as a wide targetman. Shrew makes a compelling point. I do believe it will be difficult if not nigh impossible to create the role I want, but dammit I wanted it and I was willing to stretch the engine to limits of its possibilities to make it happen. Anyway, enough ranting about the limitations of the ME, let’s look at Shrew’s actual idea. For example, using the AMR as a ‘wide targetman’ and then asking him to ‘sit narrower’ with a very attacking overlapping wingback, you could more or less get a similar effect. The AMCR would be the ‘shadow striker’ getting ahead of the WTM and looking for knock-ons etc whilst the AMCL is the passer and the AML the full-on winger. Now, the idea sounded really solid on paper. In reality, it looked a little something like this. In Shrew’s words, you get the best of all worlds – still have the passer / runner combination in the middle, an overlap on the right and the winger on the left to provide the width and you’re not running the risk of the deep targetman being crowded out by 2 CD’s and 2 DM’s – instead he may more often be challenging a shorter fullback for the header. In terms of positioning, the idea seems to have worked out just fine. 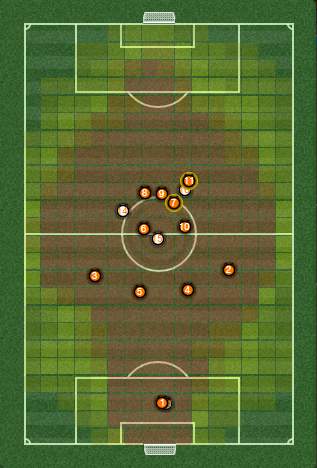 Looking at the heat-map for one of the test-games, you can see this. #7 was the Wide Target Man, whereas #11 was the Shadow Striker, with a license to roam. The wide targetman indeed cuts inside to receive the ball, opening up space on the flanks for the shadow striker to exploit. Looking at the match stats, it would appear that Nordby, the #7 and Wide Targetman, has played a blinder in this match. #7 Erik Nordby is the Wide Targetman. We can see that Nordby is definitely being instrumental upfront. The man receives many passes, wins the odd header and he’s basically doing everything right. So what’s not to like? Let me illustrate that by looking at the goals scored in that match. To answer the inevitable question what you’re supposed to see here, let me take you back to the initial idea for the withdrawn targetman. I wanted a player who could beat opposing players for headers and contribute with flick ons, and hold up the ball by controlling aerial balls played into his chest. Such a player would play with his back to goal to help relieve opposing team’s pressing and allow our runners to link up. I wanted this player to play a typical targetman role about 15 metres deeper than where a targetman usually plays. He would pair up with a shadow striker or trequartista making runs forward to get on the end of a flick-on or get the rebounds from the headers. Are we seeing Nordby challenging for headers anywhere? Are we seeing runs off his shoulder by surging midfielders? Nope, we have not seen any of this. Beating Spurs 5-2 with a squad largely comprised by anyone not an international in my squad (which means it’s reserves and U19’s on the pitch with a few veterans like Nordby and Messarina) is a good result, but it’s not what we set out to achieve. So is Shrew’s idea a failure? No, not in the traditional sense it’s not. It adds more variation to the strikerless approach, it adds a new way to approach matters, it has even given me ideas to employ a wide target man. Has Shrew’s idea helped me achieve what I wanted to, a withdrawn target-man as described above? Unfortunately not, so in that regard this experiment has been a failure.